Ministers of funky New Orleans barrelhouse blues, Big Mojo Records presents the outrageous Porterhouse Bob (featured, with his five piece band and special guests, on vocals and keyboards). Simply the best party music west of the Mississippi. Turn it up. This exciting funky New Orleans barrelhouse and zydeco blues band has been turning heads everywhere they go. 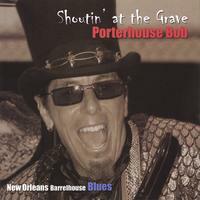 Their new CD, "Shoutin' at the Grave" is a testimonial to their unique sound and upbeat vibe. The CD is their second release on Big Mojo Records. The always outrageous Porterhouse Bob fronts the band on vocals and keyboards (piano, accordian, organ). He is backed by Mitch Montrose on drums and rubboard, Leslie Baker on bass, Charles Burns on alto and tenor sax, Graham Dorsey on bass, baritone and tenor sax, George Pandis on trumpet and fluegelhorn- all seasoned veterans. "Shoutin' at the Grave" also features the talent of special guest artists like funk drummer James Gadson, alto and tenor soloist Jeff Jorgenson, and gospel backing vocalist Shawntae Jackson. The songs embrace the musical variety and enthusiasm of Porterhouse Bob's live show and their first release, "Rockin' the Big House", but clearly this is a band that has no intention of sitting still. With this new release, their sound has grown by leaps and bounds. The quality and clarity of this new recording is outstanding. The funk grooves are rock solid. The zydeco is simply on fire. The barrelhouse blues is over-the-top. Like the man said, "If this don't get your feet moving you must be dead".